As a New Jersey portrait photographer that works primarily in Monmouth, Ocean, and Mercer counties, it can be pretty important for me to know the best photo spots in those areas for my clients. So if you are looking for a great spot for your next photography session or looking for the perfect engagement photo location, I hope this helps you find a great spot. 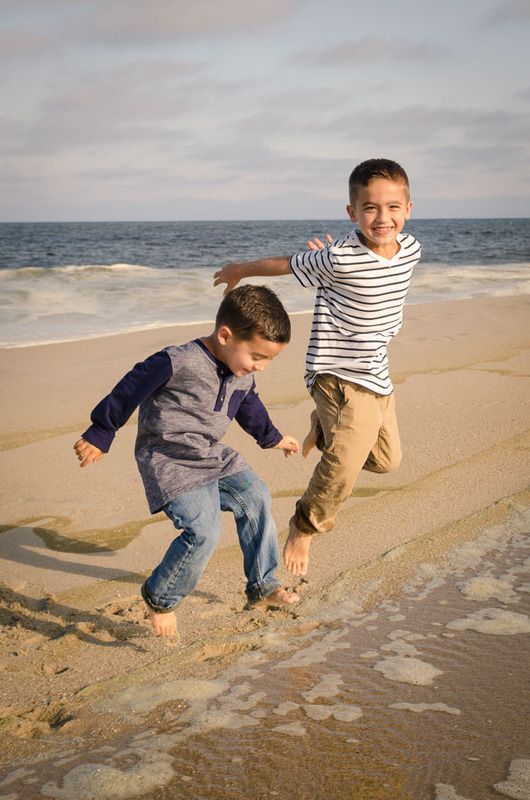 If you want to learn more about my Jersey Shore photo sessions, CLICK HERE. There is no specific spot listed here for Asbury Park because the entire stretch of shore-front in this town is the perfect setting for individual and family portraits. It’s as if someone took a trendy Brooklyn neighborhood and dropped it off at the beach to enjoy the sun. You can start the day at convention hall. It’s an amazing piece of architecture that sits right on the boardwalk. As long as it’s not too crowded when you are there, this can serve as a great backdrop for some group photos. Take a short walk south and you’ll get to the Asbury Park Casino which is now just a shell of the old building but the doorways right on the boardwalk work great for framing portraits. It will give your photos an interested cross between casual beach and urban looks. Head back north along the boardwalk and you can’t miss the amazing murals on the sides of the buildings. Some photos leaning up against these walls will make others think it was a high end, on location, fashion shoot. 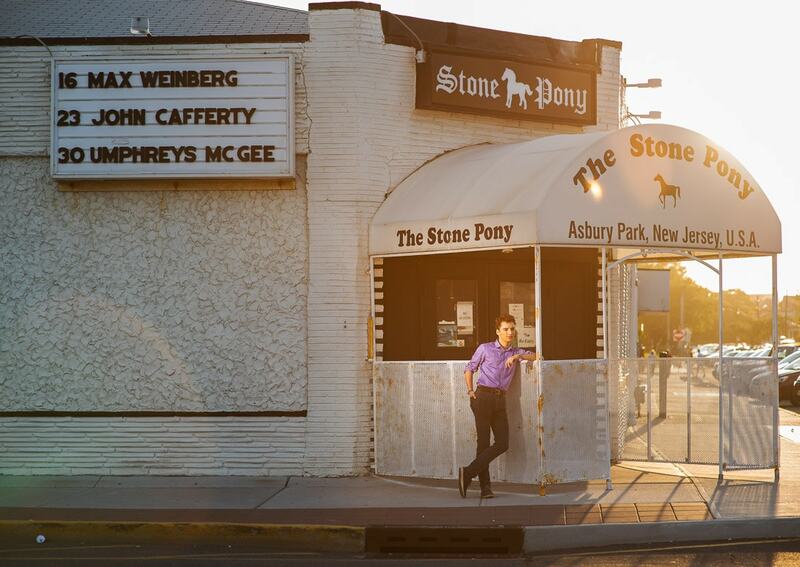 You can’t miss the Stone Pony, where Bruce Springsteen rose to popularity. If you have any interest in the history of rock and roll, you’ll want to try and feature this location in some of your photos. Vintage shops, restaurants, and bars like the Wonder Bar round out the rest of the great photo spots in this town. Long Branch Beach is like a tiny taste of Miami on the Jersey Shore. Ok, so it can’t compare to the real thing but with the addition of Pier Village and some high end hotels, there is a decidedly modern feel to this part of the Jersey Shore. Long Branch Beach has a lot of great opportunities for unique images. During this shoot there were huge tide pools for the kids to play in. Start on the boardwalk to the right of McLoone’s. There is a gazebo that is frequented by weddings and portrait photographers alike. Most of the construction in this area is very new and looks amazing in photos. The gazebo is great for framing a family group shot or even just one of the kids dangling their legs off the boardwalk over the sand. Moving onto the beach, it is like most beaches in the area. There is a nice jetty for some background elements. It can get a little crowded during the busy times so be aware that you may have to do some creative framing to isolate your subjects from the rest of the crowd. As the sun goes down, move back onto the boardwalk where there are a couple outdoor nightclubs that make for excellent blurred light backgrounds. If your photographers has some skill with flash photography then you can get some beautiful “Miami-esque” shots with these bars and clubs in the background. 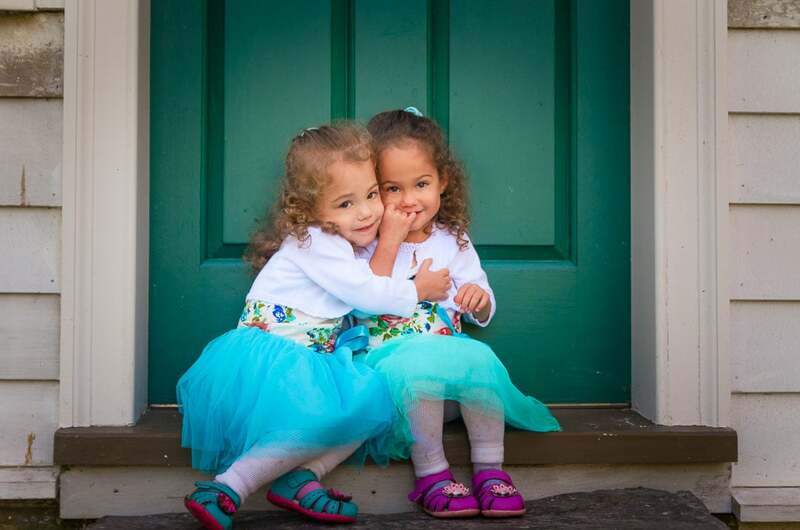 You can check out some of my Long Branch family portrait shoots HERE. No, I didn’t accidentally write the name of the town twice! The lake itself in this beautiful town is also named Spring Lake. Just a few blocks off the beach is a pristine lake that is the perfect setting for family photos. Also located here is St. Catherine’s church. While more of an attraction for wedding photos this spot is nonetheless a great spot for family portraits as well. If you are luck with some interesting skies during sunrise or sunset then the background of the church can make for an incredibly dramatic photo. Just across the street is the lake itself. You can start on the side of the lake under some of the trees or on a park bench. However, what I love about this location is the bridges. There are a couple very interestingly designed bridges crossing over sections of the lake. Whether you stand in the middle of the bridge to frame the shot or opt for an angle looking over the bridge, you can’t go wrong. PRO TIP: Try a bunch of different poses and angles on these bridges, they are beautiful and interesting from any side and you’ll want to make sure you get some shots you like. Ask your photographer to help you plan out some ideas ahead of time. I make sure I talk to all my clients in a pre-shoot consultation so we can have a plan going into the shoot and they get exactly what they want hanging up on their walls. Allaire is a park that has all the standard “park things” but then throws you a surprise like a big old train right in the middle of the park! Its a really cool place and although you may need to do a little driving to hit all the great spots, it’s well worth it. Antique buildings are always a great place because they give your photos a timeless feel. Allaire is the first place I would suggest to someone that wants a woodsy feel to their photos. Not only is it a huge park with many places to choose and trails to explore, there are a number of very unique spots in Allaire. There is the Historic Village with a number of very old homes and buildings that are perfect for that old country feel to your images. You can also visit the Museum of Transportation and have your shoot in front of the trains. If all that isn’t enough, then bring a picnic basket and a blanket and stage the perfect family picnic for your family portrait. Bring some actual food though, Allaire is big and your photographer may get hungry! PRO TIP: Allaire is also a great place to go for winter family portraits. Many of the spots that look good for photos are accessible by car without much walking so it is perfect to visit after a snowfall. You can make some images that look like something out of a movie. This covered a big area and there are number of options you can take to shoot at Sandy Hook. But all of them are good options! If you are interested in history, you should check out Fort Hancock, home to the Sandy Hook Lighthouse. There is, of course, the lighthouse itself. You can climb to the top for a great scenic overlook. More interesting to me is the small group of homes that dot the area. Of special note is officers row, a group of houses perfectly lined up along the water’s edge. During sunrise and sunset, they make for quite a dramatic background. Also interesting are the concrete bunkers built along the beach in some areas. You have to take a very short hike to get to some of them but that is something that you don’t typically see in a family photo. If you are a family of history buffs or a military family, you will definitely find this area interesting. There is more to Sandy Hook. As well as Fort Hancock, it has some beautiful public beaches. For those in northern Monmouth County, this would be a great choice. There are plenty of areas where you can get more “traditional” beach photos, such as lifeguard stands, lifeguard row boats with the beach’s name on it, jettys, and even some areas of tidal pools if you’re lucky. These are great for getting some very cool reflection shots. Red Bank along the Navesink has almost a New England kind of feel to it. You can start off right in the streets of Red Bank. With brick sidewalks in some areas and beautiful buildings, it is the perfect combination of city and seaside. Then you can head down to the marina. I would suggest shooting there during sunrise or sunset to capture some dramatic images and beautiful skies against the backdrop of the boats. Before the sun sets and the light goes away, find a spot where you can take some photos riverside. This is the classic old school looking amusement park that really lends itself to great photography. Before heading to the amusement park, you can visit the fishing pier for some interesting “under the pier” photos. But don’t spend too much time there because the real beauty of this location is in the amusement park. It doesn’t have the most up to date rides and games. Some would even call it a little old. But when it comes to making beautiful and interesting photos, that is exactly why Keansburg is a great spot. It’s almost as if it got trapped in time around the 80s or 90s. Those who grew up then and now are raising kids of their own will feel right at home. The classic look will add a movie like quality to the images. A good photographer can use these elements as part of the portrait rather than just background. Get there as the sun goes down and the lights on the rides and games go on and you might end up with some unique and special family photos. I am a huge advocate of candid photos when kids (and other family members) are just having fun and being themselves. They are the most authentic. Turkey Swamp Park is one of those places I never heard of or thought to shoot at until I visited it and saw all the great locations. Turkey Swamp Park is 2,266 acres of wooded areas, trails, and playgrounds. There is also a 17 acre lake where you frequently find people boating and fishing. It’s the quintessential spot in central Monmouth County for a nature or park styled photo shoot. While it is a great place to have photos taken any time of the year when the weather is nice, this place really stands out in the Fall. The combination of the lake and beautiful Fall colors can be a perfect setting for your family photos. Just make sure you are dressed appropriately. The reflections of the leaves on the lake just add to the magic. The many trails will let you find a secluded spot away from the crowds too. Since we live on the east coast, it can be hard to find a good place to see a stunning sunset. This is one of them. If you go to the Manasquan Inlet and head back inland along the inlet, you will discover Fisherman’s Cove Conservation Area. Aside from being a cool park and a gathering place for dog owners, this is an amazing place to watch the sun set. Portrait and landscape photographers both love this place. Before the sun sets, make sure to visit the beach and get some photos along the jetty by the inlet. If the lifeguards have left you can use the downed lifeguard stand as a perfect prop to lean on. If Manaquan is a little too calm for you, remember, Point Pleasant is just across the inlet. Heading south from many of the spots above into Ocean County and you’ll get to my favorite boardwalk, Point Pleasant Beach, NJ. Residents and out of town visitors all love this place, and it’s just an awesome location for family or individual portraits, I would be doing a disservice to you if I left it out! Here are some of my family portrait sessions from Point Pleasant. First, let’s talk about the beach. It has all the characteristics you would want on a beach for family or individual portraits. It has palm trees. These are not abundant in New Jersey, even at the Jersey Shore. Start out down by the inlet, just across from our previous location in Manasquan. If you are there on a weekend (which is when I do most of my shoots) then it will be less crowded over there. You can get some cool images near and around the palm trees. For the most part they keep these palm trees in great condition considering this isn’t exactly a tropical climate. Then head down to the water. Over by the inlet there is a jetty that you can sit on. I like to have a family with older kids all sit on different rocks on the jetty and try to look cool. They either succeed in looking cool and its an epic photo or they all crack up from trying to look cool and its a beautiful family moment. Either way, it works. As you walk back towards Jenkinson’s, you can get some great photos with the pier and the bustling boardwalk in the background. Don’t end it there, though. Once back on the boardwalk, you have even more options. 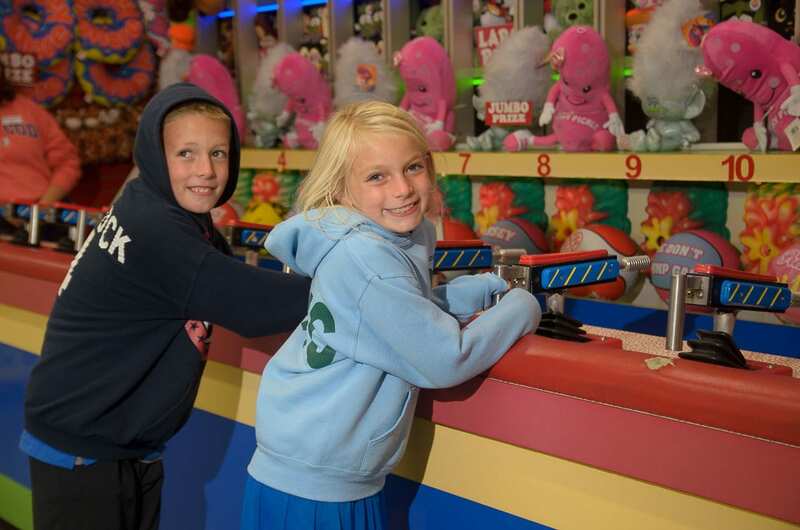 Point Pleasant is one of the iconic boardwalks in New Jersey, so don’t miss out on it. Everything from rides and games to arcades and ice cream stands are right there for the perfect summer vacation feel in your photos. You can even try to get some shots playing skee ball. Talk to your photographer about getting some unique photos here. 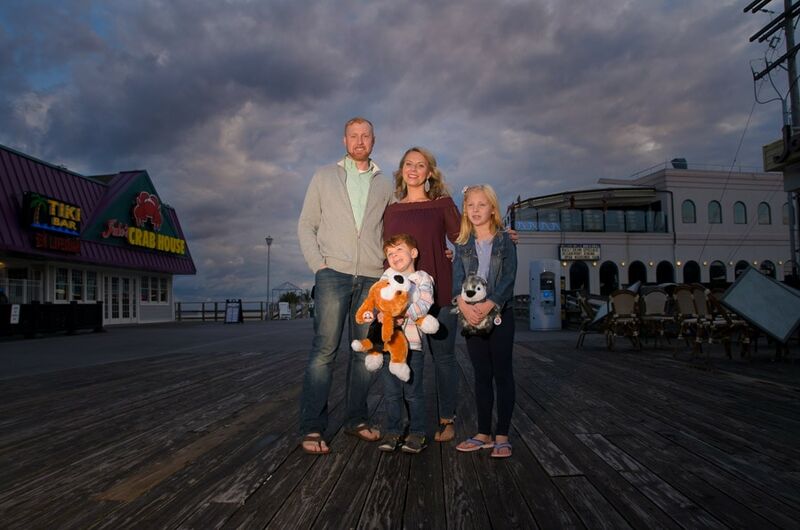 Whether you are a local or on vacation and want some professional photos to commemorate the occasion, the boardwalk is the perfect place for that family portrait. Do you have a favorite photo spot in Monmouth or Ocean County? Let me know in the comments below.